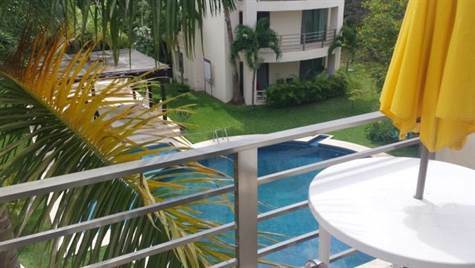 Ejido Town, Playa del Carmen – In a quiet area, this spacious two-bedroom condo for sale includes 2 bathrooms. A quiet, beautiful and restful place to live. Common area and pool are very well maintained. With a 24-hour security guard on duty you will enjoy peace & quiet. Spacious, modern and cheery, this condo has 3 balconies, one of them facing the pool. Ceiling fans, oven range, stove, hookups for washer/dryer, 3 air conditioning units, 3 hurricane storm shutters and a well-furnished condo. Community description :A quiet neighborhood, close enough for shopping, going to the beach, and quick highway access for day trips to Tulum, Akumal + so much more. Highlights of surrounding area :Walk to nearby parks, bicycle path. Call today to see this affordable option in Playa del carmen Real Estate. Great value, location and lifestyle included !